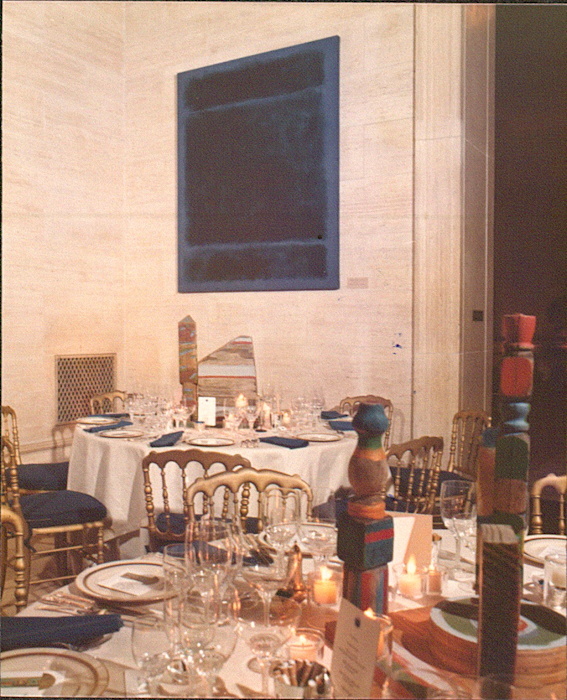 Here are photos of Betty Parsons’ sculptures on the dining tables at the opening dinner for the National Gallery of Art’s first exhibition of modern art, held in 1973. 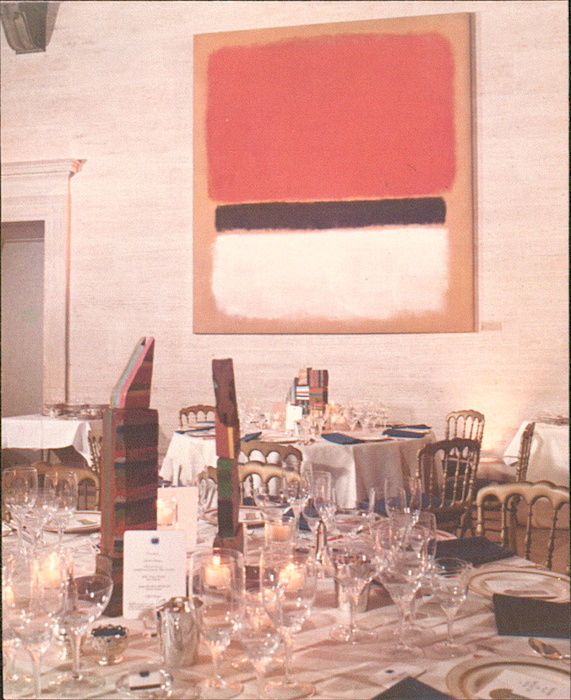 On the walls are many Rothkos. When J. Carter Brown became the NGA’s director he made the controversial decision to hold VIP dinners in the museum itself. NGA president Paul Mellon’s wife Bunny, renowned for her gardening and interior design acumen, took upon herself the role of planning flowers and decor for many of these special events. I have yet to track down the checklist, but the show’s press release [pdf] says there were 26 works by 23 artists installed in the temporary exhibition galleries on the main level. 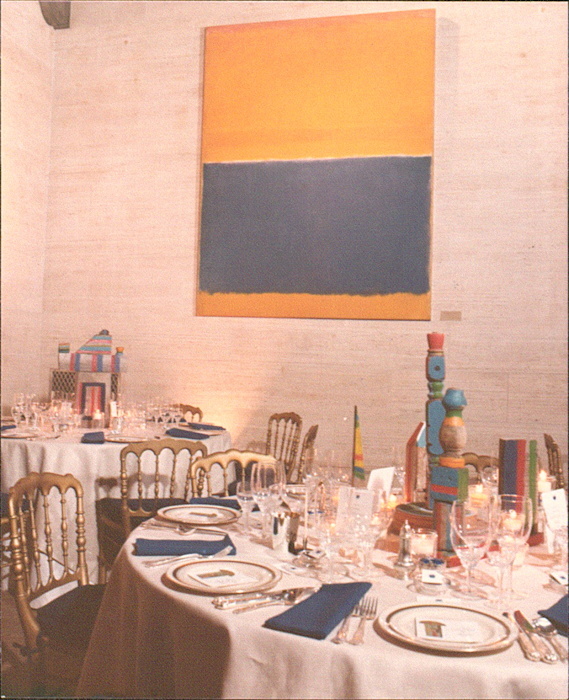 Yet these photos show at least eight Rothkos, in a room which I believe is on the far west end of the ground level. According to Bunny Mellon: The Life of an American Style Legend, by noted centenarian socialite biographer Meryl Gordon, Mrs. Mellon asked Parsons to provide some of her painted found wood sculptures-a letter in the Archives of American Art [p.23] says “10 or so,” but Gordon says 14, and I count like 28-to “adorn [the] tables” at the dinner. Parsons’ datebook [p.132] shows she attended. Mrs. Mellon was a frequent customer and friend of Parsons. Parsons exhibited her own sculptures and paintings in Washington DC’s Studio Gallery beginning in 1972, and would later show Bunny’s daughter’s artworks in New York. 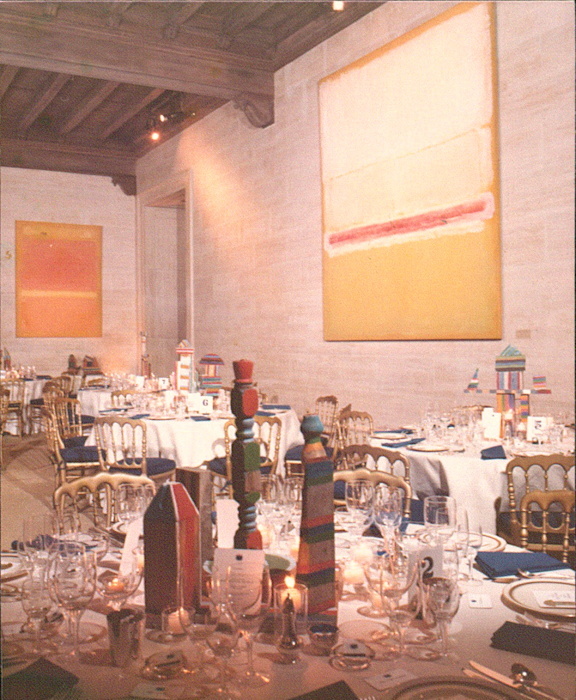 There is an invoice [p.16] in the Archives of American Art for printing table cards for the NGA dinner. I think they’re the gilt-edged ones in the bottom of the picture above. It struck me that as a dealer, Parsons had been instrumental in the careers of many of the artists in the show. Yet her own artwork was being relegated to decoration. But Gordon notes that Bunny also loaned the Rothkos. Which might mean Bunny’s concept for the dinner was a two-artist show. 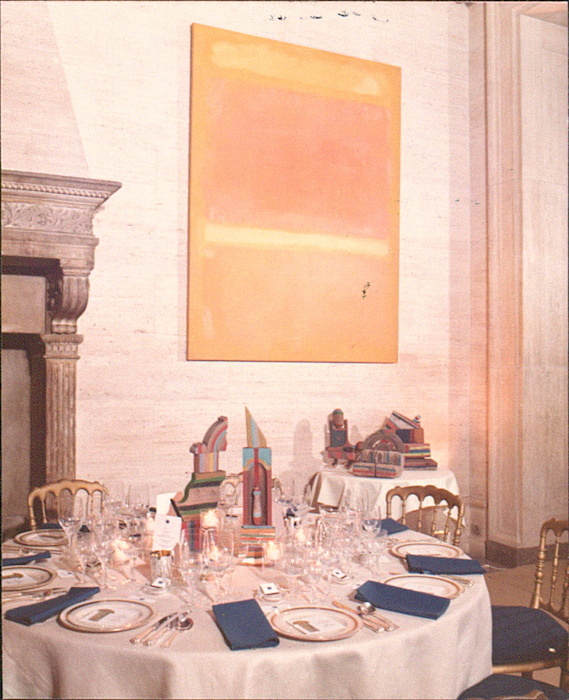 Notice above, the table under the Rothko which has nothing but Parsons sculptures on it. Also, wow, every place setting has its own ashtray and embossed matches. Quoting Lee Hall’s 1991 illustrated biography of the gallerist, Gordon wrote that Parsons worried the partygoers “will hate my work.” She also wrote that all “her table sculptures for the National Gallery sold out.” Wait, what?